In 1993, Crestwood resident Marianne Fitzgerald and the Southwest Portland Transportation Committee penned a letter to Portland City Councilor Earl Blumenauer, imploring the city to add safe biking and pedestrian infrastructure along Southwest Capitol Highway. Twenty-four years later, after Oregon voters approved funding for streets improvement in 2016 and Gov. Kate Brown reversed her initial decision to scuttle funding for the project this summer, the plan for the Southwest Capitol Highway Project is finally under development. 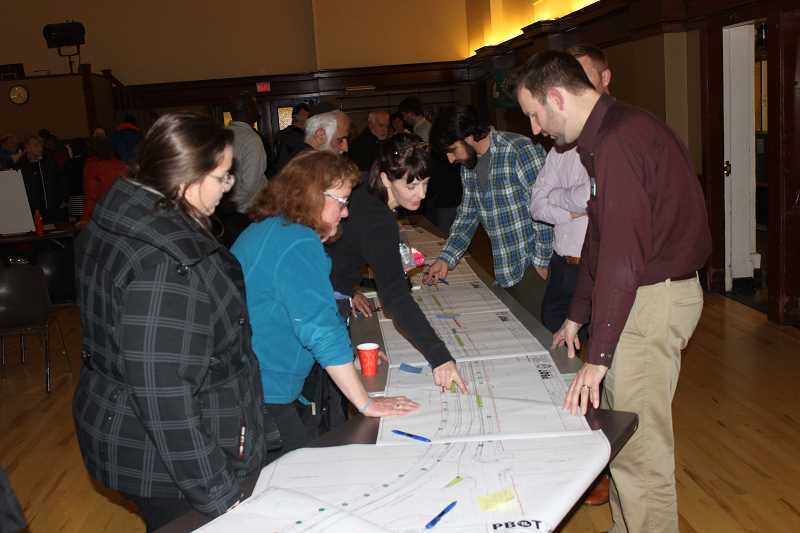 Fitzgerald and myriad Southwest Portlanders listened to the Portland Bureau of Transportation and Bureau of Environmental Services describe a nascent iteration of the plan and provided feedback in a late November gathering at the Multnomah Arts Center. The project addresses transportation and stormwater issues in areas from Taylor's Ferry Road to Garden Home Road. It would add sidewalks as well as bike lanes to an area that is bereft of both, and also build stormwater facilities to decrease flooding incidents and improve water quality. "It's coming along pretty well. It's nice to see places where people can walk safely and not have to walk through the mud to get to destinations," Fitzgerald said. The project is estimated to cost between $10 million and $15 million and will be funded by the Fixing Our Streets ballot measure that passed in 2016 — which dedicated $64 million to improving transportation infrastructure in Portland — as well as other state and local investments. At the Multnomah Arts Center gathering in November, Project Managers Steve Szigethy and Ruben Gonzalez-Crumley described some potential measurements of the plan, which is 30 percent completed. Szigethy said a protected bike lane and a six-foot sidewalk could be added to the east side of Capital Highway and a multiuse path where pedestrians and bicyclists intermingle could be added to the west side of the road. He said building the multiuse pathway would save money and wouldn't endanger pedestrians due to the west side's uphill slope. "And we feel better about doing that on the west side because, except for one part, it's generally uphill, so the difference in speed between people on bikes and people walking is not going to be that large compared to the east side," Szigethy said. Fitzgerald is skeptical about the multiuse path idea, though. "That concerns me. I know it was a compromise that we agreed to to only have sidewalks on one side of the street and the other side of the street, the west side, would have a multiuse path. And so that's good that we'll have bike paths in both directions, but we need to minimize the conflicts between pedestrians and bicyclists," she said. Fitzgerald also hopes the bike paths are constructed so that students can bike from home to school and back safely. "One of my comments was to design it so we encourage kids to ride bicycles, because you could easily ride a bicycle to Wilson High School or to Jackson Middle School or to PCC, but you can't just design them for the competent rider. You have to make sure that middle school and high school kids are confident in riding as well," she said. Fitzgerald said some motorists drive dangerously fast on Capitol Highway and she hopes that the implementation of sidewalks and bike paths will slow down traffic. "Just having that sidewalks is going to make people pay more attention. Right now, it looks like a country road and they just fly right through it," she said. As for curtailing stormwater, collection and treatment facilities could be added to Southwest Spring Garden Street and Multnomah Boulevard, Southwest Dolph Court, Southwest 42nd Street and Southwest Alice Street, and Southwest Brugger Street to Taylor's Ferry Road. Also, 24 five-foot-wide stormwater-capturing green streets could be added as well. "In the corridor, we're proposing a brand new, separated storm-collection system that has inlets, inlet leads connecting to manholes and new storm mains connecting between those manholes. Right now there's virtually nothing, and what does exist is a hodgepodge of deficient infrastructure," Gonzalez-Crumley said. BES staff said the project wouldn't solve all flooding issues, but it would help. "There are so many flooding problems in these four basins, it's unbelievable. People are drowning in stormwater, and I'm pleased to see the Bureau of Environmental Services come up with these designs," Fitzgerald said. "It's a great start, but they need to pay for them. It's going to be challenging to pay for all of the needs and improvements for this project, and I don't want to cut corners. I want this project done right, because it will never get redone, not in my lifetime for sure." Based on a tentative schedule, project managers hope to reach the 60 percent completion mark by the spring, the 95 percent completion mark by the summer, award a construction contract in 2019 and finish the project by 2020. In the coming months, ODOT and BES will consult with landowners on Capitol Highway to work out issues. They will also explore optimal surface materials and examine tree-removal and planting needs. Fitzgerald said she is happy to see the project move forward and hopes a desireable endgame is reached. "This is a great first step. I'm really happy to see this thing moving forward. But the devil's in the details. I'm hoping the details will get ironed out very shortly after this," Fitzgerald said.